Have you ever gone on vacation, pigged out the entire time, and not gain anywhere near as much weight as you thought you would? Ever go away on vacation to somewhere warm and tropical and feel AMAZING and energetic even though you’re staying up late at night and on the go all day? The same weird experience happens to a lot of people. Yet get this… Breathing better air can reverse these same symptoms in as little as 20 minutes! So do you need to move to an island in the Caribbean to be healthy? You just have to decrease your daily exposure to carbon dioxide. This is eye opening stuff. And to tell you the truth I was shocked and horrified to discover it myself in the brand new Thin Air book that I just finished reading last week. Yet the great thing is it gave me a ton of tricks that I’ve been using and they instantly gave me a noticeable boost to my energy. There is a big difference between losing fat and permanently killing off fat cells. Turns out, this isn’t true, fat cells do live a long time (roughly ten years), but they do eventually die. And.. sometimes this process can be sped up. Like when your fat is exposed to cold. This means something non-exercise and non-nutrition related can have a DIRECT impact on the amount of fat cells in your body. Now, you may be wondering… why should you care? When you gain weight you also gain fat cells. People who are overweight typically have MORE fat cells that people who are lean. However, when someone who has been overweight loses weight, they STILL have more fat cells than someone who is the EXACT same weight, but was never overweight. When you diet your fat cells shrink, but they don’t go away. This matters because recent research suggests the the number of fat cells you have impact how hungry you are. And research shows that people who were overweight, but then lost weight are typically hungrier than people who are the same weight, but were never overweight. In other words, the number of fat cells you have matters. Losing fat cells also smooths out stubborn fat areas like your love handles and stomach “paunch”. Even better, research suggests this loss is near permanent. The best part is you have the ability to alter the number of fat cells you have, WITHOUT diet or exercise. The process is slow, but the research is impressive. This is the topic of my new book. In an odd sort of way, watching the latest BBC Horizons documentary hosted by Dr. Michael Mosley called ‘Eat, Fast Live Longer’ was a lot like watching myself discover intermittent fasting all over again. The show starts with the host Dr Michael Mosley looking to the connection between Diet and Health as a way to slow the aging process, including the ravenous affects of cancer. But not just fasting… Intermittent Fasting. Keep in mind, not only was this 8 years after Eat Stop Eat was first published, but it was apparently without Dr. Mosley ever even reading Eat Stop Eat. He simply settled on this style of fasting as the easiest form of intermittent fasting that still gave him AMAZING improvements in health, including decreasing his risk of getting serveral types of cancer. But as we know exercise has its dark side. Chronic exhaustive exercise can lead to systemic low-grade inflammation a hallmark of major diseases including: Cardiovascular disease, Rheumatoid arthritis, hypertension, and diabetes definitely things we want to avoid, especially if we have other health issues, like obesity. So taking part in a sensible exercise program is a good idea, but overdoing it could be very detrimental to long-term health and disease prevention. With exercise being ruled out, Dr. Mosley examines the strong connection between health and diet. We know that for decades teams of scientists around the world have been intensity studying aging, and we know that the genes you inherited from your parents play the largest role in how you age, but you can still do certain things to help the process…or more accurately – slow the process. Again, the goal isn’t to reverse or stop aging all together, but to age WELL. One of those things is simply eating less. Research has shown us that eating less can change both the quality of life, and how long you are expected to live. In fact, we’ve known this since the 1930 when live expectancy surprisingly increased in the United States during the great depression. During the documentary Dr. Mosley interviews Dr. Luigi Fontana – one of the Referenced researchers in Eat Stop Eat. After the interview with Dr. Fontana the show moves to examining “Cronies”, the nickname for people who follow a calorie restricted life style. Next, Dr. Mosley suprisingly asks Joe the Cronie “What if it’s all wrong?” and then challenges him to take some tests to see who is healthier. After all the cronie “Looks fit, but not impressively young”. They take part in a series of tests and it is revealed that while Joe may not ‘look young’ he is surprisingly younger than Dr. Mosley on the inside. After going through these thorough medical examinations Dr. Mosley realizes that “My diet is undermining my health” and that eating less seems to be the solution. Then, Dr. Mosley comes to the exact same conclusions as I did regarding traditional Calorie Restriction… It sounds great, but I’m never going to do it! Next, the show moved to talking about something called IGF-1 and its relation to cancer and various other diseases. (This should not be confused with growth hormone, or the variant of IGF-1, called mechano-growth factor, which is responsible for the muscle growth associated with muscular work). In this part of the show Dr. Mosley is told that his typical style of eating had caused his IGF-1 to be extremely high… making him ‘at risk’ for developing several forms of cancer. (This part of the documentary reminds me a lot of the chapter on Autophagy in Eat Stop Eat, stressing that there must be time for recovery and rebuilding on a cellular level if optimal health is the goal). After some more discussion the concept of fasting is finally revealed as a way to significantly lower IGF-1 Levels. However, Dr. Mosley starts with a 3.5 day fast, the exact same mistake I made when I started my research in 2006. And he came to the exact same conclusions that I did… there must be an easier way! Dr. Mosley seemed obviously upset at this point in the documentary. He had stumbled upon the amazing benefits of fasting, but was not really ready to sacrifice his normal life so that he could fast for 3 days in a row. At this point he realized that there is an easier way, and goes on to explore the major benefits that can be had with short, 24 hour fasts, which obviously makes me really happy. With 24 hour Fasting Dr, Mosley comes to the same conclusion as most people following Eat Stop Eat, 24 hours of fasting is NOT tough, especially when you divide it up in a way that fits your lifestyle… When done properly it just becomes a simple yet effective way of life. While experimenting with 24 hour fasts Dr Mosley also makes the same observation that most Eat Stop Eat people make; Hunger does not continue to get worse and worse over the course of 24 hours (ie: 24 hours later you’re not 24 times hungrier) but instead, hunger comes and goes in waves and these waves are easily manageable. During this time he makes comments about ‘Repair mode’ basically speaking about autophagy and inflammation without actually saying autophagy or inflammation (two major chapters in Eat Stop Eat). I also smiled when he discovered how tasty food is after a fast. During this time he interviews Dr. Krista Varaday, another scientists that is referenced in Eat Stop Eat. Dr. Varaday mentions that you can eat whatever you want as long as you stay within your Calorie goals, notice Dr. Varaday says eat WHATEVER you want, not HOW MUCH you want, big distinction, and she’s absolutely correct – that’s how we do it with Eat Stop Eat with phenomenal results. Dr. Varaday also pointed out what we all have found: fasting tends to affect your appetite, it’s very hard to ‘compensate’ for your fasting by grossly overeating. It’s difficult but not impossible – so don’t go out of your way to ruin amazing results by seeing ‘what you can get away with’. Next he meets with Dr. Mark Mattson (also referenced in Eat Stop Eat) who states that “sporadic bouts of hunger actually cause new braincells to grow”. He’s talking about animal research obviously, but it’s still very cool. Finally, On the advice of Dr. Mattson, Dr. Mosley turns to what he calls the “5/2 diet” , or Eat Stop Eat. So in the end, in order to radically improve his health he converts to the Eat Stop Eat style of intermittent fasting with amazing results. After 5 weeks Dr. Mosley was able to cut his IGF-1 levels in half, lowering his risk of getting more than 7 different types of cancer! 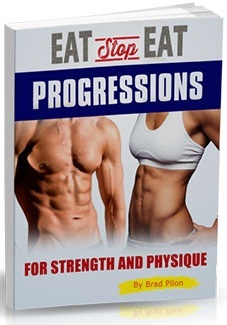 The diet Dr. Mosley followed was almost exactly Eat Stop Eat, with one small but important exception… With Eat Stop Eat you should also be doing some form of resistance training. Remember the Eat Stop Eat lifestyle is the combination of Intermittent fasting and weight training, and I believe that the weight training is the missing part of this whole scenario, and is what keeps you LOOKING younger and FEELING younger physically. All in all it was a fantastic and well done documentary that did an excellent job explaining the many benefits of this style of eating, without the sensationalism that typically comes when people talk diet. PS – I should point out that Eat Stop Eat style fasting is the type Dr. Mosley settles on, but by no means does he (or do I) suggest that it is the only type of intermittent fasting, check around, use the type that works best for you. Dr. Mosley has now written a book on his experience with the 5:2 diet. This book recounts his experiences with the diet, and could be considered the written version of his documentary. 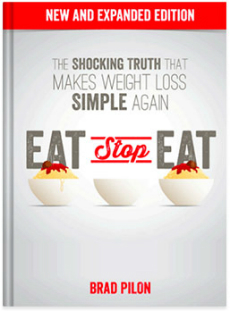 I should point out that while similar, there are some BIG differences between “The 5: 2 Diet” and Eat Stop Eat. The 5:2 Diet is a recount of Dr. Mosley’s personal experiences with Fasting, while Eat Stop Eat remains the go to Scientific reference on the topic of Intermittent Fasting. The 5:2 Diet also includes a 500 to 600 Calorie ‘Allowance’ while you are fasting. While I have no doubt that you will lose weight following tihs protocol, I do have isues with calling it ‘fasting’. While it may sound easier at first, I have found that 500 Calories over 36 hours to be more difficult than zero calories for 24 hours *However, I am biased in this regard. Either way, I still thank Dr. Mosley for bringing a high level of exposure to Intermittent Fasting. I’ve finally finished the updates to my book “How Much Protein”. My recommendations really haven’t changed in this new expanded version, but I have added some rare exceptions to these recommendations and some more explanations on how the protein you eat works (and doesn’t work) in the muscle building process. How Much Protein should I eat if I want to Build Muscle? Plus, I’ve included the creatine research because I think it’s an extremely valuable but misunderstood supplement.